I’m madder than Ed Anger writing on deadline stone cold sober. Call me crazy—go ahead, I dare you! I double-dog dare you!—but I always read Weekly World News for the articles. You know, the all that stuff about Bigfoot, Bat Boy, and mutant alien redneck babies. And Ed Anger’s trenchant political commentary, of course. 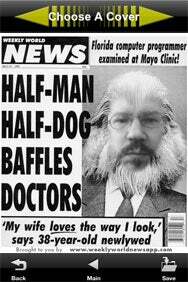 Your Face Here: Weekly World News lets you insert your face into one of 24 covers from the infamous supermarket tabloid. So when I heard that Appy Entertainment had developed a Weekly World News app (no doubt using secret alien technology developed by the government at Area 51) for the iPhone and iPod touch, I insisted that I review it. Weekly World News features a collection of 24 of the venerable investigative journal’s finest covers, from the 980-pound bride who married the 98-pound man to the woman who had Bigfoot’s baby. And, oh yeah, Bat Boy. The gimmick here is you can insert your face on the covers. The app comes preloaded with three faces, including a grimacing man, a bewildered woman, and a kitty cat with freakishly large eyes. But who wants to look at those losers when you can use the iPhone’s built-in camera to photograph yourself, position the image, and import. The app then “renders (your face) in glorious black and white.” Fun for the whole family! And that’s all there is to it. Some of the covers work better than others. You can shake your iPhone for a random cover, but with just two-dozen to choose from, that gets old fast. You can e-mail the images to friends, which involves a convoluted process of exiting the app and selecting a picture from your phone’s camera roll. The app is a pleasant diversion, I guess. But with a solid record of more than 30 years of award-winning investigative journalism, I admit that I was hoping for something a little more…, well, substantive from Weekly World News. Weekly World News is compatible with any iPhone or iPod touch running the iPhone 2.2 software update.